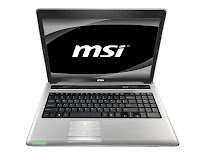 MSI CX640DX laptop has a 15.6-inch display with a resolution of 1366 x 768 and 16:9 aspect ratio. The display is equipped with nVIDIA Geforce GT540M graphics card with 2 GB DDR3 graphics VRAM. Powered by second generation Intel Core i3/i5/i7 processor, this laptop features DDR3 1333 MHz memory which upgradeable up to 8 GB (2 slots), up to 640 GB SATA HDD, and Intel HM65 chipset. The keyboard has 99 keys. The Input/output ports available on this laptop are HDMI port, D-Sub (VGA) port, two USB 3.0 ports (optional), two USB 2.0 ports, headphone-out jack, and mic-in jack. MSI CX640MX is also equipped with 2 speakers, 1.3 MP webcam, six or eight-cell battery, card reader, 802.11 b/g/n WLAN, 10/100/1000 LAN, as well as optional Bluetooth 3.0.